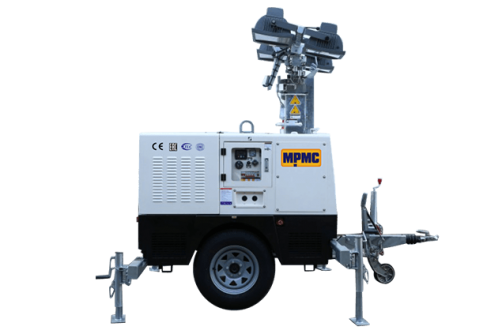 MPMC light towers, relied on its high reliability, maximum safety, easy operation and simple maintenance etc., are suitable for varies applications like construction site, mining filed, rental business, public equipment service, accident handling, large-scale event, homeland defense and disaster relief. Genuine engine/alternator and high-level configuration ensure to provide reliable power for customer. Standard design and personalized modification ensure delivery of the project at the earliest time. Supporting safe lifting bars from top of the canopy. High-tensile mast material and structure. Safety protection system to raise up and bring down the mast. Fully bunded base frame, completely sealing up and friendly environmental protection. Optional on road trailer, easy for transportation with low transport cost. Clamshell canopy design allows maximal maintenance access. Mast 360°rotation and lights 90°adjustment.